One of the things I love most about working in the Internet industry is that we never stop learning. There is always something new to try and offer our clients and I personally love learning just as much as I enjoy teaching. We’ve recently been hard at working learning as much as possible from top Social Media Experts at the Social Success Marketing Summit. 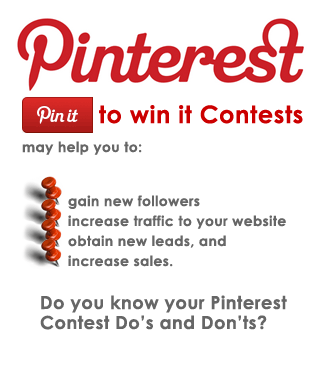 The following Pinterest Contest Guide was inspired by a recent webinar by Melanie Duncan. Running a Pinterest contest is a great way to gain new followers, increase traffic to your website, obtain new leads, and increase sales for your business. Within this guide, we will discuss useful tips and guidelines for running a successful contest on the Pinterest platform. 1. Read Pinterest’s anti-spam guidelines and contest guidelines. 2. Remember that Pinterest is all about inspiration. 4. Make it easy to participate and make your guidelines clear. 5. If you are going to reference Pinterest in your contest, review their branding guidelines. 1. Ask Pinterest to sponsor or promote your contest. This is greatly frowned upon! 2. Make people pin or repin your contest rules. 3. Run a sweepstakes in which each action (pin, repin, new board, follow, like) counts as an entry. 4. Require comments or any other potentially spam-related behavior. 5. Require a minimum number of pins. 6. Ask for votes with pins, repins, boards, or likes. One of the most important aspects of running a Pinterest contest is having a strategy. Before starting your contest, determine your guidelines, the goal of your contest, and what you will award to winners. The first step in building a successful Pinterest contest is determining your ultimate goal. a. 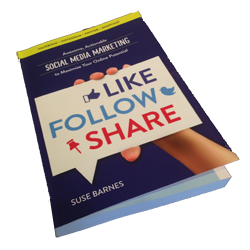 To gain more followers: Require entrants to follow you on Pinterest. b. To gain traffic to your website: Ask entrants to create a new board with your company’s name in the title and have them pin their favorite images from your website (and other images about your company) to the new board. You can also run a campaign similar to this with the goal of increasing brand awareness. c.	To increase sales: Offer a select number of items for a possible giveaway and ask entrants to pin their favorites. Another option is to have entrants pin images of them using your product. Once you establish your contest goal, create a clear outline of contest guidelines for participants. Keep it simple so your contest is easy to enter. You’ll receive more entries this way! a.	Don’t limit your contest promotion to Pinterest. Instead, utilize your other social networks, your website, and your mailing list as channels on which to promote your Pinterest contest. b. Create an eye-catching contest page on your website and use this as “home base” for your contest. This gives participants a gateway to your website as well as a location to refer back to after the contest is over. This is also a great place to host key images you would like to see pinned as part of your contest. c.	Create an eye-catching “pinnable” image to help launch your contest and spread the word. This should be colorful, include your brand, and include a call to action such as “pin to win”. This should also include a buzzword such as “promotion” or “giveaway” and mention of what the prize will be. b. Judge based on criteria such as the number of repins an entry received or pin creativity. Whichever method you choose, be sure to be up front with entrants in your contest guidelines! a. If you collected email addresses for all participants, notify them of the winner via email and offer everyone a discount or other small prize for their participation. b. If signing up on your mailing list was not an entrance requirement for your contest, notify contest winners via pin comment and also update the contest page on your website to reflect this information. •	Choose a great prize! Tangible items tend to work best. •	Whatever your method of notification, offer a small, limited-time discount to all contest participants. This will continue to drive interest and sales. •	Run your contest for approximately 10 days to prevent your promotion from being too short to be noticed or too long to keep people interested. •	After your contest ends, change the text on your website contest page to let participants know that it has ended and that you will inform them when the next contest begins. Have a form available for them to sign up on your mailing list. Do you have any successful contest campaigns you want to share or questions about Pinterest? Please post in the comments below. It has the such as you read through my thoughts! You seem to know a whole lot somewhere around the following, just like you submitted it inside something like that. I have faith that that you can do by incorporating pct to help power the solution house a little bit, even so as an alternative to that, this really is amazing weblog. A fantastic go through. I’m going to absolutely return. or anything you can suggest? I get so much lately it’s driving me mad so any assistance is very much appreciated.